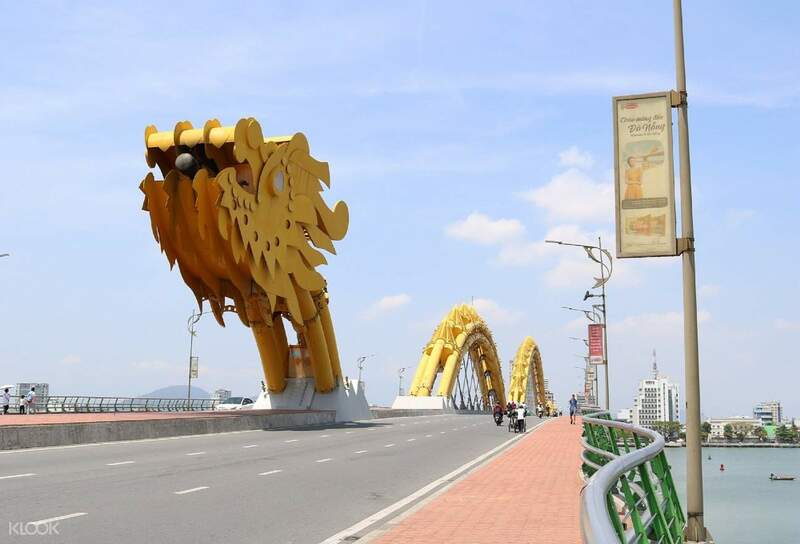 Hop on a motorbike and enjoy a thrilling ride into the beautiful city of Da Nang! We had Hien and Anh Thu, 2 cheerful girls as the driver, we discussed where to go to fit in our preferred schedule. They are very thoughtful and help to take a lot of pictures leaving us good memory. They drive safely. by asking what we haven't tried before, we tried nice local food. recommend to take this tour as you can see a lot and be explained lots of knowledge. Hop on a motorbike and get ready for a thrilling journey as you hit the streets of Da Nang! With sightseeing and food on the menu, feast your eyes (and stomachs!) on some of the world's viral street food spots sizzling up local favorites including authentic bành mí, steaming hot noodles, and fresh-from-the-wok fried rice with spectacular views of Da Nang that make every mile worth the travel. 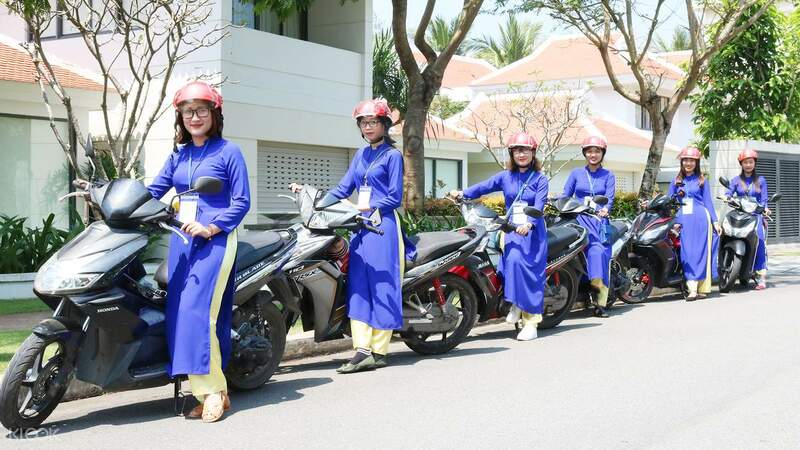 Guided by a professional team of Aodai-wearing female bikers, you're in for the ultimate Vietnamese experience as you roam the town. 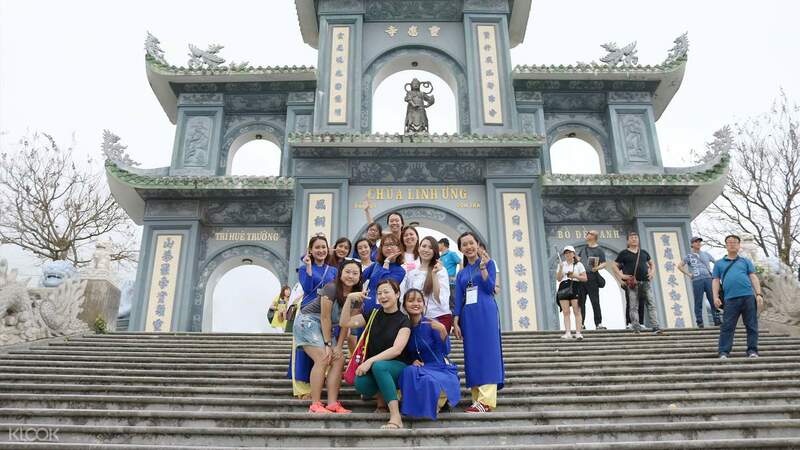 The tour begins with a visit to the Lady Buddha at Linh Ung Pagoda, situated in the heart of Da Nang overlooking the crystal blue waters of the Son Tra Peninsula. Slow down and go for a walk in the sand at the My Khe Beach next. 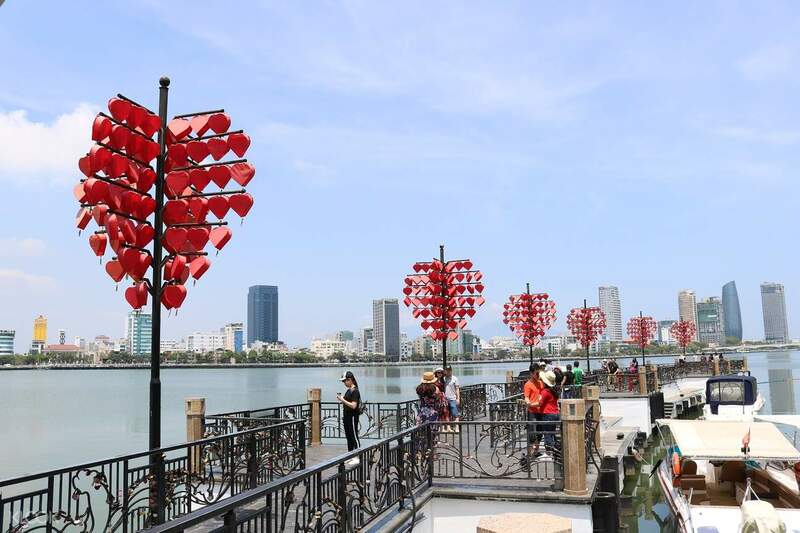 Along the way, you'll pass by Da Nang's iconic bridges – Dragon, Love Lock, and Han River Bridges – overlooking the gorgeous Han River opposite the pristine beaches in town. After that is some cultural visit at Da Nang's religious sites, the Cao Dai Temple and the infamous candy pink Da Nang Cathedral. Enjoy a shopping spree at Han Market where you can buy souvenirs for you to take home. After, you'll have a hearty bowl of Mì Quàng, a local staple you shouldn't miss because you can't end a great tour without good food. Complete with free pick up and drop off service, this tour package is worth every penny if you're looking to experience Vietnam's every day local culture. We had Hien and Anh Thu, 2 cheerful girls as the driver, we discussed where to go to fit in our preferred schedule. They are very thoughtful and help to take a lot of pictures leaving us good memory. They drive safely. by asking what we haven't tried before, we tried nice local food. recommend to take this tour as you can see a lot and be explained lots of knowledge. We had Hien and Anh Thu, 2 cheerful girls as the driver, we discussed where to go to fit in our preferred schedule. They are very thoughtful and help to take a lot of pictures leaving us good memory. They drive safely. by asking what we haven't tried before, we tried nice local food. recommend to take this tour as you can see a lot and be explained lots of knowledge. I give 10 stars for this tour the tour guide is excellent she ware blue Aodai dress, pick me up at hotel lobby 7.30am and bring me to the Lady Buddha, 1st destinations . She explain in English with easy to understand, she is very kind and helpful. There are some misunderstand about the program tour but she help me to get the program that I booked. After finish program she also take me tour around to other sightseeing places and help me bargain in the Han Market and she drop me at the airport. I am very impress with this tour this is the good experience good fun. If you would like to book this tour please ask for the name Tuyen this is the name of the excellence guide. I give 10 stars for this tour the tour guide is excellent she ware blue Aodai dress, pick me up at hotel lobby 7.30am and bring me to the Lady Buddha, 1st destinations . She explain in English with easy to understand, she is very kind and helpful. There are some misunderstand about the program tour but she help me to get the program that I booked. After finish program she also take me tour around to other sightseeing places and help me bargain in the Han Market and she drop me at the airport. I am very impress with this tour this is the good experience good fun. If you would like to book this tour please ask for the name Tuyen this is the name of the excellence guide. Overall, we like the tour with Aodai Rider and highly recommended. My girls really enjoyed their first ride experience and singing all the way. The Aodai Riders are friendly. May be they considering my girls are young, they brought us further to Asia Park instead of Cao Dai Temple, Danang Cathedral & Han Market in the town. However, I think they should communicate before making the change. Also, I really wished that we could stop at the fishing village before the Linh Ung Pagoda to take some pictures with the fishing and basket boats but just passing by (even after making the request as the leader didn't communicate with another rider in the group). Overall, we like the tour with Aodai Rider and highly recommended. My girls really enjoyed their first ride experience and singing all the way. The Aodai Riders are friendly. May be they considering my girls are young, they brought us further to Asia Park instead of Cao Dai Temple, Danang Cathedral & Han Market in the town. However, I think they should communicate before making the change. Also, I really wished that we could stop at the fishing village before the Linh Ung Pagoda to take some pictures with the fishing and basket boats but just passing by (even after making the request as the leader didn't communicate with another rider in the group). Good sight seeing experience travelling with two pretty young ladies including Tuyen Uyen. Thank you so much for the scooter ride and arrangement. Will surely recommend it to my friends next time when they visit Da Bang. Good sight seeing experience travelling with two pretty young ladies including Tuyen Uyen. Thank you so much for the scooter ride and arrangement. Will surely recommend it to my friends next time when they visit Da Bang. Great memory, tour guides are kind and lovely. What a wonderful day. Great memory, tour guides are kind and lovely. What a wonderful day. We have had a wonderful bike trip experience in Vietnam. Our tour guide is funny and knew different languages in Chinese, English and Korean. Her name is Tuyen Uyen ＆Le Thao. They made me know more about Vietnamese culture and living. We have had a wonderful bike trip experience in Vietnam. Our tour guide is funny and knew different languages in Chinese, English and Korean. Her name is Tuyen Uyen ＆Le Thao. They made me know more about Vietnamese culture and living. I was so happy to explain it kindly and introduce you here and there safely while traveling. 친절하게 설명해주고 안전하게 이곳저곳을 소개해주셔서 여행하는동안 너무 즐거웠습니다.